Protecting your data center against power failure is crucial to providing maximum availability. Power loss or poor power quality is a major contributor to data center server down time. This task takes more than simply having UPS and a backup power source, such as a generator. Dual Power Paths: A Crucial Element in a High-Availability Data Center article tells that in in high availability environments, a common way to provide redundancy is to supply two independent power paths to each piece of computing equipment. All Dual Feeds Are Not Created Equal white paper explains the classification system for data center power feeds and provides the pros/cons of each configuration. The use of dual power path architecture in combination with IT equipment with dual power supplies and power cords is an industry best-practice. Data centers designed and built utilizing Tier IV requirements are by definition “concurrently maintainable,” which means any system or component in the data center may be shut down for maintenance or may fail without affecting the delivery of services to the end user. In the case of a dual-powered data center, this typically is achieved by delivering at least two power circuits to each cabinet, one from the A power source and one from the B power source. The equipment accepts the two power feeds via independent, parallel power supplies that are sized such that the equipment will continue to operate with only one power path. To make this work the equipment to be powered need to have Redundant Power Supplies. Redundant Power Supplies are one advanced feature available on high-end server machines. In essence, this is a power supply that actually includes two (or more) units within it, each of which is capable of powering the entire system by itself. If for some reason there is a failure in one of the units, the other one will seamlessly take over to prevent the loss of power to the PC. You can usually even replace the damaged unit without taking the machine down. Design Tips for the Dual-Powered Data Center and Four A-B Design Failures to Avoid in the Dual-Powered Data Centerarticles gives some more tips how to design dual power paths. You need to be careful in designing dual-powered data center. Failure to properly design, size and implement dual power infrastructure at the cabinet may lead to breaker trip during restart (starting current of many computing devices and storage systems could easily exceed 200% of the running load for some time). You need to have enough spare capacity, but on the other hand failing to fully load power circuits to their rated capacity may not result in downtime but may drive power subscription costs higher than necessary. Proper power planning and budgeting involves loading every circuit to the proper rated capacity while respecting safety margins. The protected equipment must support dual power feeds and operate with one feed faulted. The loading of breakers within each power path must always be less than 50% of trip rating during normal conditions, so the breaker doesn’t trip if the alternate path has to take on the full load. Meeting these two requirements can be a challenge. Especially because some computing and networking equipment is only available with a single power cord. It’s good design principle to disallow the use of single power cord computer devices in a high-availability data center environment, but there are case where those can’t be avoided. For example some network products or legacy servers may only have single power supplies. One good way to over-come single power input equipment problem is to use an Automatic Transfer Switch (ATS), which generates a single feed from two inputs. These single power supply devices can still be used with reliability by utilizing automatic transfer switches. Redundant Power Supply article has the following picture to show the use if automatic switch. Powering single-cord equipment in dual path data center environments article tells about a new white paper from APC-Schneider Electric addresses the concern of powering single-corded equipment in dual path data center environments. However, equipment with a single power supply introduces a weakness into an otherwise highly available data center. Transfer switches are often used to enhance single-corded equipment availability by providing the benefits of redundant utility paths. You need to understand the use of power transfer switches well because there are several possible configurations how to use them, with their pros and cons. Powering Single-corded Equipment in a Dual Path Environment white paper goes on to describe three fundamental approaches to powering single-corded equipment in a dual path data center environment. There are a number of options for integrating single-corded devices into a high availability dual path data center. Powering Single-corded Equipment in a Dual Path Environment paper explains the differences between the various options and provides a guide to selecting the appropriate approach. The conclusion is that Power availability to the single-corded equipment below 10 kVA is optimized by bringing utility redundancy directly to the rack. This can be done by using a rack mount static transfer switch or a rack mount ATS, and the optimal solution is a rack mount ATS. A well designed adaptable rack enclosure power system would be able to support a single or dual path environment or a hybrid of both single and dual equipment. Automatic Transfer Switch (ATS) used in data center is typically rack mountable and occupy 1U or rack unit of space. They feature dual input cords and are able to switch from one power circuit to the other in a few micro seconds when power failure is detected on one of the input leads. The idea to write about this topic to this blog came to me after reading Powering Single-corded Equipment in a Dual Path Environment white paper. Linear Technology’s LTC4371 ideal diode-OR controller provides low-loss ORing of two negative voltage supplies in 48-V telecom systems. It permits seamless handoff between redundant power supplies, replacing power Schottky diodes and associated heat sinks with N-channel MOSFETs, reducing power loss and voltage drop. APEC 2016 – Plenty of hardware, but where was the software? However, digital power products by themselves do not deliver what can truly be considered as Software Defined Power ®, which is what CUI sees as the essential next step for digital power in moving to the system level and adding intelligence outside of the power supply. Other industries are layering software on top of hardware to advance system-level solutions for greater efficiency, lower capital and running costs, and other benefits. Considering that 10% of the world’s electricity is now consumed by data centers, efforts to manage power on a system-wide basis are well overdue. Strategies like “peak load shaving” combined with backup capabilities are needed to even out load fluctuations and eliminate single points of failure. Paralleling supplies: good, bad, or ugly? it lets you work with one make/model of supply and get to know its inherent characteristics and idiosyncrasies (and they all have some!). Unfortunately, paralleling supplies is not as simple as the term suggests. Strange and often unpleasant things can happen if you just connect the outputs “as is.” Generally speaking, you can’t just connect the outputs of two supplies together unless the supplies have been specifically designed for such operation. Problems include output voltage inaccuracy, poor regulation, output droop, all the way to possible damage if the “stronger” supply tries to force current into a weaker one (and no two supplies–even the same model–are identical). This paper presents the basic characteristics of power supplies and discusses the methods of paralleling units which do not already have special provisions to enable them to be configured in parallel. • “COPS” is an electrical system serving part or all of a facility that must operate continuously to support public safety, emergency management, national security, or business continuity. The requirement for a COPS is determined by governmental authorities in accordance with codes or statutes, or by facility engineering documentation. • A “designated critical operations area” (DCOA) is an area that, by virtue of the functions performed within it, requires a COPS. Examples include air traffic control centers, police and fire stations, 911 call centers, communication centers, business data-processing centers, and broadcast stations. The NEC, as an installation code, doesn’t determine which facilities require a COPS. Instead, it describes how the system must be installed. • “Supervisory control and data acquisition” (SCADA) is a control and monitoring system for the COPS. Long used in industry, this term is new to the NEC with Article 708. It’s defined in the Article, but doesn’t appear among the requirements. Informative Annex G lists requirements for a SCADA system, but these provisions are informational rather than prescriptive. Those requirements, though, are not code; they amount to suggestions for how a SCADA system might be installed. For now, in the NEC, SCADA is an acronym without requirements. NEC Article 708 describes a number of documentation requirements including a risk assessment, a hazard-mitigation strategy, and maintenance and testing records. NEC Article 708 permits storage batteries, uninterruptible power supplies (UPSs), and fuel cell systems as alternate sources for COPS. These systems are uneconomical and unwieldy for all but a minority of COPS applications. Typically, the project characteristics will strongly push the alternate source selection toward generators. Linear Technology’s LTC4420 dual-input monolithic power prioritizer for 1.8-V to 18-V systems ensures smooth backup switchover to keep critical circuitry alive during brownout and power-loss conditions. Its 18-V operating capability accommodates a wide range of power sources, including wall adapters, USB ports, supercapacitors, and stacked batteries with lithium-ion, alkaline, or NiMH cells. Eaton Corp. (Raleigh, N.C.) claims its cloud-based software ensures that universal power supplies (UPSes) will keep your computers up and running 24/7/365. Called PredictPulse Insight, the software monitors the UPS’s components with a rule-based algorithm that tracks the batteries’ discharge history and determines when “80-to-90 percent of the UPS’s lifetime has been used up for the battery, capacitors, fans, air filters, and, if equipped, the power module [inverter, rectifier and the insulated gate bipolar transistor],” said Art Mulligan, product line manager at Eaton Corp.
Eaton is a variety of Internet of Things (IoT) services that can predict at least 80 to 90 percent of the component failures in a variety of devices, such as vehicle transmissions before they happen. Health care facilities, especially hospitals, have more stringent selective coordination requirements than conventional building electrical systems, according to some electrical engineers. Although a building’s entire electrical distribution system is important, its overcurrent protection is the most critical to safety. Overcurrent includes short circuits and overloads. During a short circuit, electrical current bypasses the load, taking the path of least resistance. An overload is an overcurrent condition within normal current paths. If an overload is allowed to persist, it can cause equipment or wiring damage and potentially start a fire. Temporary overloads can be harmless; sustained overloads can cause damage. Temporary overloads occur frequently, are often a routine part of system startup or operation, and should be allowed to subside. An overcurrent protective device (OCPD) should not open the circuit during normal operation, allowing motors to start and loads to stabilize. Overcurrent scenarios dictate the type of overcurrent protection that should be used. To address arc flash problems, we turn to codes and standards. NEC 240.87 is an important leap in arc flash safety for the electrical industry, along with NFPA 70E and IEEE 1584: IEEE Guide for Performing Arc Flash Hazard Calculations. “Failure is not an option.” This quote from Eugene Kranz, a flight director for NASA during the Apollo 13 space mission, defines the concept of mission critical in five words. Yes, the Apollo 13 mission may be an extreme example of mission critical, where every decision and every action made was essential to the survival of the astronauts aboard that unstable spacecraft. When describing the electrical distribution system for a mission critical facility, two of the key components are availability and reliability. The electrical system must be available when called upon to function (24/7) and it must not fail while in operation. Based on this “must not fail” philosophy, most of the protection systems for mission critical facilities traditionally have been designed to keep the system operating. As such, protection devices are set as high as possible to prevent them from tripping and de-energizing the critical load. This philosophy guards against dropping the critical load, but it does not protect the equipment or more importantly, the personnel working on the equipment from potential hazards such as arc flash. NFPA 70E and IEEE 1584: IEEE Guide for Performing Arc Flash Hazard Calculations are the two standards used by the industry for guidelines and analysis regarding arc flash and arc flash safety. Arc flash hazards are usually expressed as a unit of incident energy (cal/cm2). Incident energy is a measure of thermal energy at a working distance from an arc fault. Mission critical facilities also tend to have generators for backup power with closed-transition capabilities that allow the load to transfer from generator to utility without interruption (or vice versa). During this closed-transition period, the generator and utility operate in parallel and both contribute to the fault current, which results in increased amounts of fault current. Because of the larger systems and closed-transition transfers, data centers often have a higher magnitude of available fault current throughout the distribution system, leading to higher arc flash thermal energy. The farther away a person can be from a fault, the lower the incident energy exposure. The 24/7 availability and reliability components of a mission critical facility require a comprehensive preventive maintenance program. Often, this preventive maintenance program demands that the equipment be operated or worked on live. For example, using infrared for scanning cable lugs to ensure all connections are tight. Working on equipment live puts the personnel working on the equipment close to the fault; therefore, they are at risk of severe injury. Another issue with data centers is that electrical equipment, such as power distribution units and remote power panels, is often located in a data center’s white space, which is occupied by unqualified electrical personnel. In addition to those working on the equipment, the explosive force caused by an arc flash can injure bystanders in close proximity to the arc flash. For this reason, an arc flash boundary is calculated in addition to the working distance. Something worth noting is the difference between arc fault current and bolted fault current. Bolted fault currents (two conductors being bolted together with little or no impedance) and short circuit values normally are calculated at maximum. Bolted fault currents are used for sizing the interrupting rating of equipment and setting the protection devices. Arc fault currents are calculated based on the assumption that there is a small gap between the conductors that is bridged by something causing the arc. Because of the impedance caused by the gap and the bridging component, the arc fault current is usually lower than the bolted fault current. Lower current means a longer time period before the protection device clears the fault. The failure-is-not-an-option mentality of a typical mission critical facility and/or data center has pushed the configuration and coordination of the protection system toward keeping the system operating. High instantaneous devices or devices with built-in time delays are used in an attempt to avoid nuisance tripping. Although this philosophy keeps the electrical system operating as long as possible, it also extends the duration of the arc flash by delaying the time to clear the fault. If the arc fault happens with a magnitude to the left of or less than the instantaneous region, the protection device will operate in its time-delay region, extending the duration of the arc flash. Depending on the protection device used, this could result in a clearing time of 2 seconds. For many owners of older data centers, arc flash study results are indicating that they have high levels of incident energy and thermal energy within the distribution system. This high level of energy is requiring personnel to wear 40 cal/cm2 PPE protection (safety glasses, hearing protection, leather footwear, hard hat, arc-rated gloves, arc-rated flash suit, arc-rated flash suit hood). Due to the critical nature of the facility, the majority of electrical distribution equipment will require maintenance and adjustments while energized. Therefore, something must be done to reduce the incident energy level to within the range of a hazardous risk category so that it can be worked on with the proper protective equipment and clothing. Whether it is a new design or existing facility, the preferred method and least costly solution for mitigation is a re-evaluation of the coordination study. Incident energy is the result of short circuit current and clearing time under arcing fault conditions. Another form of zone protection is current differential protection, most commonly used with medium-voltage systems. This uses current transformers to measure and compare the incoming and outgoing currents. Because this protection system is independent and associated only with a particular zone, it is not required to be time-coordinated with other systems, allowing for tripping without additional delay. This system uses a combination of light sensors, which detect the flash of light associated with the arc fault, and relays that detect the high fault current. When both conditions are present, the relay will quickly clear the fault by opening the upstream device without any delay. For protection, both conditions must be present. Arc resistant equipment is designed to provide protection to those workers surrounding the equipment from internal arcing faults under normal operating conditions. Arc resistant equipment normally provides the required protection by venting the hot gasses and explosive material away from the work area surrounding the equipment. The maintenance-mode switch is normally an external switch wired to the circuit breaker that allows the operator maintaining that piece of equipment to modify the trip settings of the device to a lower setting. The lower and faster setting is intended to reduce the incident energy levels downstream of the device. Using remote operators, such as hard-wired control switches, programmable logic controller-based human-machine interface screens, and supervisory control and data acquisition systems allows the worker to be completely outside the room and outside the arc flash boundary when breakers and switches are operated. Wire manufacturer finds a way to eliminate hazard and control labor spending. One of those e-houses is a 20-foot-long trailer mounted up a flight of stairs on a mezzanine. It is filled with breakers, PLC panels and had a an arc flash hazard rating of Category 3, which corresponds to an incident energy of 8 to 25 cal/cm2. The Category 3 rating requires anyone working inside it to wear personal protective equipment (PPE) consisting of safety glasses or goggles, hearing protection, hard hat, cotton underwear, fire-resistant (FR) shirt and pants, FR coveralls (in addition to FR shirt and pants), arc flash hood, leather gloves and leather shoes. Wearing this level of PPE was a real burden in terms of time and money for the manufacturer and its employees. The PPE was time-consuming to put on and take off, uncomfortable and confining. The manufacturer had arc flash labels in place and had the proper PPE on hand, but it looked for a way to reduce the Category 3 hazard rating. Each installation, including circuit breakers and parts, cost roughly $60,000. In addition, the reduction in arc flash hazard was insufficient. The plant engineering team learned about arc flash relays from its electrical distributor, Mayer Electric, who suggested that an arc flash relay might provide a solution. This relay uses light sensors to detect the light of a developing arc flash and sends a signal in less than one millisecond to open the upstream power breaker. By interrupting the power quickly, it dramatically limits the amount of incident energy, preventing a small arc from growing into a dangerous and destructive event. On the front of the enclosure they installed a pair of lights that indicate the status of the arc flash relay (on or tripped). Because there were four lines feeding the e-house, it would be necessary for the arc flash relay to trip four breakers simultaneously, which was initially a concern. The relay instantaneously tripped the circuit breakers on each and every test. Installing the arc-flash relay saved $30,000 on this installation, about half the cost of the previous attempt, and the company acknowledges that it is a better solution than what they had tried in the past. The interior of the e-house now officially has no arc flash hazard. Under last year’s classification system it would have been rated as a hazard risk Category 0, but that category has been eliminated as superfluous. No hazard now simply means no hazard, and workers no longer need to don PPE before they enter the e-house. All this is accompanied by shrapnel—bits of metal, both solid and molten, that are flung at ballistic velocities. The longer the arc continues to burn, the greater the damage. There are several methods for reducing the energy available to an arc flash, including the use of current-limiting fuses. An arc-flash relay uses light sensors to detect the intense light given off as an arc flash begins and within a few milliseconds sends a signal to an upstream breaker to open and shut off the power. This stops the arc flash in its tracks. ATLANTA and SUNNYVALE, Calif. — On Oct. 25, Bloom Energy, Southern Company (NYSE: SO) and its subsidiary PowerSecure announced a strategic alliance, which will include project investment and joint-technology development to provide behind-the-meter energy solutions. PowerSecure will acquire an estimated 50 megawatts of Bloom Energy Servers under long-term power purchase agreements with high-quality commercial and industrial customers. • Enabling optimized use of power to drive cost predictability and strategic savings. • Delivering the quality and exact type of power required by each part of their business, for example, AC power for offices and DC power for data centers. • The ability to dial-in the level of reliability required from “no need” all the way up to mission critical reliability for tier IV data centers and critical operations. Question: Provide clarification on which specific pieces of equipment or systems that need to be fully coordinated per the current NEC standards? Critical operations power systems (COPS) (Article 708.54). Question: How does the ambient temperature affect the rating of circuit breakers? And what’s the impact of that rating on cable sizing per NEC Article 110.14(C)? Tom Earp: Higher ambient temperatures will reduce the amount of current that thermal magnetic trip circuit breakers can carry continuously, and low ambient temperatures increase the amount of current they can carry continuously. However, this is not a change in rating. Circuit breakers listed to the UL 489 standard must be able to carry rated load in open air, 40°C ambient. This is their rating, and they do not have alternate ratings at other ambient temperatures. Solid-state trip devices are not affected by temperature variations. Yoon: Low-voltage power circuit breakers (LVPCBs) that meet the ANSI C37 standard have two distinguishing characteristics that are pertinent to this question: they are constructed to withstand fault current for a greater amount of time than a standard UL 489 circuit breaker (30 cycles versus 3 cycles), and they have the ability to delay or defeat the instantaneous trip function of the circuit breaker. Question: How does an electronic breaker differ from a thermal magnetic breaker or a fuse in terms of TCC tolerances? Yoon: While circuit breakers with electronic trip units typically have tighter TCC tolerances than a standard thermal-mag breaker, it depends on what portion of the time-current curve is being evaluated. Most generic thermal-mag circuit breakers have reasonable ±10% tolerances in the overload/long time portion of the TCC. However, in the short time portion of the TCC, the area of uncertainty in the curve gets bigger as the mag portion of the breaker takes over. When designing generator systems, electrical engineers must ensure that generators and the building electrical systems that they support are appropriate for the specific application. Whether providing standby power for health care facilities or prime power for processing plants, engineers must make decisions regarding generator sizing, load types, whether generators should be paralleled, fuel storage, switching scenarios, and many other criteria. Expertise in generator power design for emergency, legally required standby, and business critical loads is an essential skill for an electrical engineer to master. When designing generator systems, electrical engineers must ensure that the generators and the building electrical systems can support the critical loads reliably and effectively. This article examines standby systems in which generators serve as backup to the main utility source, such as those commonly installed in airports, data centers, hospitality complexes, water-treatment facilities, and in most life safety institutional applications. Interruptions of electrical power, even for a short duration, can introduce the potential for situations that could imperil public health and safety. Extreme weather-related disasters often disrupt power to hundreds or thousands of people and businesses, potentially for days. When these situations occur, they call attention to the vulnerability of the nation’s electrical grid and the importance of alternatives. Hospitals, airports, data centers, water and sewage facilities, fueling stations, communication, and transportation systems require alternate-power sources to limit the impact and ultimately save lives during times of crisis. The loss of electrical power due to storms, natural disasters, or high-power-demand issues are increasingly common. The loss of business and the associated economic impact from power outages are significant. Emergency generators are necessary to provide the reliable power required to maintain operations during primary supply system failures. Diesel-powered generators are considered among the most reliable approaches to providing backup power. NFPA 70: National Electrical Code (NEC), Article 517.30, as well as the California Electrical Code require hospitals and critical care facilities to have standby power systems that start automatically and run at full capacity within 10 seconds of power failure. For generators rated 2,000 kW or less, it is common to install 480 V 3-phase generators and step up voltage transformers. The cost of medium-voltage generators is significantly higher-in the order of an additional $80,000 to $150,000 per unit. Additionally, medium-voltage generators generally do not have the UL listing necessary to support emergency power loads. Paralleling is the operation in which multiple power sources, usually two or more generators, are synchronized and then connected to a common bus. Phase voltages in phase and within specified voltage range. Typical parameters that determine synchronization include a voltage difference of less than 5%, a frequency difference of less than 0.2 Hz, and a maximum phase angle of 5 electrical degrees between the sources. Closed transition is used when it is desirable to transfer loads with zero interruption of power when conditions permit. It is used when the generator system transfers back to the utility and when load testing the generators with building loads. Closed transition can be either a soft load transfer or a make-before-break transfer. The typical soft-load-transfer overlap time is around 2 seconds. The make-before-break transfer will parallel the generators and perform a transfer of load from the generator to the utility. Paralleling multiple sources provides increased reliability, flexibility in load management, and maintenance capabilities with little to no disruption. Redundancy: The redundancy inherent in the parallel operation of multiple generators provides greater reliability than a single generator unit for critical loads. One of the primary purposes of redundancy is to eliminate single points of failure. Efficiency: A more efficient system provides more stability and reduces cost and losses. Loads do not remain at a constant level in most installations. Variations in power demand can cause a single larger generator to run at loads of less than 30% of capacity, which could cause wet stacking. The optimum operational point for prime movers is between 75% and 80% of its rated value. At this point, the generator will be at its maximum efficiency. Expandability: When sizing generators to match system load requirements, it is often difficult to accurately project increases in load and adequately plan for unanticipated additional requirements. Ease of maintenance and serviceability: In an N+1 paralleled generator system, if a generator in the system fails or requires maintenance, individual units can be dismantled and serviced without disrupting the function of the remaining units. This is a load priority transfer switch. It is intended for applications where a load is being supplied by both an inverter and a generator. In order to minimize the load on the battery bank supplying the inverter, the load receptacle on the switch is supplied by the generator whenever it is running regardless of the operating status of the inverter. It is automatic. When I switch off the breaker for that circuit, the relay automatically transfers power to the inverter. This is the same thing that would happen if the power went out, all loads would be switched to the inverter. This device allows fast and reliable switching between the Solar power and Grid power in my home made Off-Grid Photovoltaic System. It is able to switch up to 6 KVA of power within 20 ms. This allows nearly imperceptible switching between two power sources like Solar power and Grid or Genset power. When switching occurs, it does not impact, neither your PC nor any other appliances like TV sets and washing machines. You may just observe a faint blink on LED and neon lighting at this very moment. The main components of the source selector are two Opto Triacs wired in a SPDT (Single Pole, Dual Throw) switch fashion (Blue and Red boxes). In case both Triacs are ON at the same time, a source paralleling condition occurs. This means that the Inverter output and the Mains are connected together. This would create a severe short circuit because the inverter is not synchronized with the grid. The result in a damaged inverter. To avoid source paralleling, an interlock circuit (pink box) is placed between the processor and the triacs. This circuit based on CMOS logic inhibits simultaneous activation of both triacs. Each diode allows current to flow in a forward direction only, while preventing either supply from drawing short-circuit current. Therefore the system can continue to function if one supply fails. Although simple and fast, this arrangement has a drawback due to the diodes’ high forward voltage in their normal state of forward conduction. This creates high power and heat dissipation and an unwelcome need for thermal management and extra board space. OR-ing and Smart Diode controllers make FETs act like ideal diodes, significantly reducing the energy normally lost across the forward voltage drop of a diode. While Texas Instruments’ OR-ing and smart diode controllers reduce power loss by acting like ideal diode controllers, they also protect power sources and loads against reverse polarity conditions that could damage or reduce system reliability. TI’s controllers provide several advantages over traditional Silicon and Schottky diodes. When paired with the right MOSFETs, they reduce power loss, provide system feedback, and protect systems against voltage and current transients. lead to high power losses in form of heat and a large voltage drop. Therefore, PULS is replacing the diodes with efficient MOSFETs. The redundancy modules also receive further useful features. even voltage drops can be minimised. situation could be improved drastically. Wieland Electric Inc.’s UMS 5-W, UMS 8, LMS 16-W wienet series of Ethernet switches have redundant power supply inputs and a wide temperature operating range. 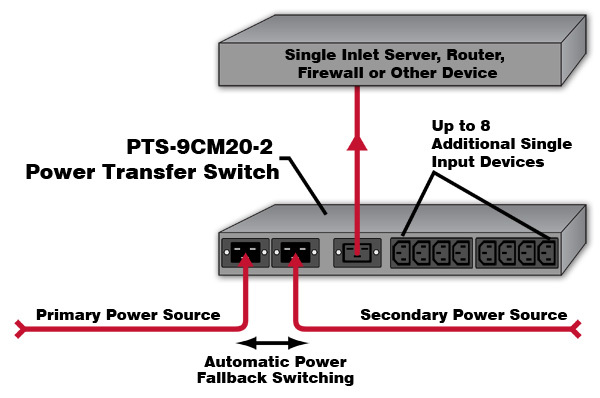 Transfer switches: Which configuration is right for your system? When it comes to picking the right transfer switch for a facility, engineers need to consider many aspects such as system installation, operation modes, and switching mechanisms to help prevent downtime in the event of a power outage. Many commercial and industrial facilities require continuous uptime to maintain business continuity in the event of a power outage. For this reason, these facilities rely on electrical distribution equipment such as transfer switches to safely transition electrical power between normal and emergency power sources. Not all transfer switches are alike, however. The sheer number of available options and configuration modes can be daunting for an engineer while designing a system. Because of that, engineers need to understand the configurations available to determine what is correct for the application’s needs when implementing transfer switch technology. Transfer switches support multiple operation modes and transition types, and feature a range of different switching mechanisms. To determine the best fit for their facility, engineers should take the time to understand all the different aspects of transfer switch configurations and make their choices based on unique application needs. By understanding the configurations available and choosing the right switch for the specific requirements, control engineers can help keep a facility up and running in the event of an outage or power loss, positioning them as essential contributors to the business’ bottom line. The device is a power monitoring and switching system that connects to Virtual Power Systems’ (VPS) ICE (Intelligent Control of Energy) software to provide dynamic redundancy inside a data center. The company notes that, usually in a data center, around half of the power infrastructure is untapped to provide redundancy to be available in the event of a failure. The ICE switch unlocks additional power by allowing facilities to use that stranded power for non-critical servers, and can still provide redundancy if a failure occurs. The ICE software combines telemetry and machine learning predictions to distribute redundant power for optimal use. The synchro optocoupler (yellow box) generates a pulse each time the Output voltage crosses zero. This happens 100 times per second in Europe and 120 times per second in 60 Hz networks. The microcontroller board receives the switching commands through a CAN bus. In my System, these commands are provided by the BMS (Battery Monitoring System). Let’s start this year with some good news! The most power hungry data center appetites are ready to be satisfied now with the most sophisticated feature set in industry with #RPCM32A – Resilient Power Control Module with 32A inlets. The Russian developer of horizontally scalable solutions and infrastructure equipment, #RCNTEC announced the release of its newer, more powerful version of its remote power control module Resilient Power Control Module with support of 32A on inlets – RPCM 32A. This solution allows users to reliably energize today’s high-performing servers, blade chassis, rack servers, powerful network equipment, electric motors, and other high power consuming devices, with powerful PSU. This new version of the smart power control module RPCM 32A retains all the functionalities of its 16-ampere predecessor but with the new power capacity added. RPCM 32A has also been implemented in a 1U form factor and allows for up to 10 devices with a total capacity of 7.7kW to be connected simultaneously, enabling system administrators to turn on/off and reset each of the devices connected to RPCM without physical intervention. RPCM 32A combines an automatic transfer switch (ATS) without interruption to the operation of the connected device with outlet level short circuit (SC) protection, power meters accounting for active and reactive power, and proper grounding indication. Within this smart power control module, RPCM enables electrical current consumption limits to be configured for each outlet, which helps prevent fire hazards. In addition, it allows device activation sequence and delay to be correctly set following a complete outage. “RCNTEC offers a new way of looking at power supply organization for devices and expands upon the standard capabilities of PDU. We’re convinced by this after having tested RPCM’s basic version at our lab. All the functions reported by the manufacturer work at a high level of quality and help to provide for a safe, stable, and controllable supply of power to equipment. As far as price goes, RPCM compares favorably against similar devices with fewer functions. This new, more powerful version, which has kept all the basic functions, will be of interest to our clients using high-performing, energy-intensive solutions,” – comments Alexander Kuznetsov, Technical Director at StoreData. “In fall of 2017, we presented to the market our remote power control module RPCM with electric current support of 16A on inputs, which was met with great interest. We got many comments from market professionals and discovered a demand for a similar device capable of supporting a higher capacity. Now we’re already prepared to introduce to the market this new version of RPCM, which is functionally equal to its predecessor, but with electric power support twice higher at 32 amps on inputs. Now users can connect to a single RPCM 10 more powerful client devices with SC protection, provide them with backup power, and control their energy consumption,” – comments Dennis Neshtoon, CEO of RCNTEC. Despite (or as a result of) the economic downturn, the use of renewable energy options have grown over the past several years, supported by federal and state programs including federal tax credits, state renewable portfolio standards, and a federal renewable fuels standard. Discuss the renewable energy options available to engineers when designing power systems. Review various alternative power sources, such as combined heat and power (CHP). Learn about resilient power options. Failure of power generation systems serving hospitals, airports and transportation systems, water- and waste-treatment plants, police stations, and public safety food distribution could result in supply shortages, considerable disturbance to public order, and a significant economic impact both regionally and nationally. The need for reliable power at every building is essential, but in recent years, several blackouts in the U.S. have highlighted the need for resilient power systems at critical facilities. Owners of critical infrastructures need to reconsider their power and backup power systems to be more resilient with the constant updates in technology. Rather than relying on more diesel generators or stand-alone nondispatchable options, which in most cases are very expensive, integrating nondispatchable designs with dispatchable systems is a good practice. Part of this is understanding the definitions of both dispatchable and nondispatchable technologies. A dispatchable source of electricity is an electrical power system, such as a power plant, that can be turned on or off and can adjust its power-output supply based on demand. Most conventional power sources, such as coal or natural gas power plants, are dispatchable systems. In contrast, many renewable energy sources are nondispatchable. Renewable sources, such as wind and solar power, generate electricity based on variable sources, which affects the flow of output energy. This article provides guidelines on distribution systems’ levels of redundancy, the correct generator rating to use, and whether solar power can be used in a data center. Know the difference between 2N, 3M2, and N+1 system topologies. Understand the characteristics of the system topologies. Learn the criteria for rating generators. Understand the different transformer types. There isn’t a single “best” system topology. There is only the best topology for an individual data center end user. 2N: Simply designing twice as much equipment as needed for the base (i.e., N) load and using static transfer switches (STS), automatic transfer switches (ATS), and the information technology (IT) and HVAC equipment’s dual cording to transfer the load between systems. The systems are aligned in an “A/B” configuration and the load is divided evenly over the two systems. In the event of failure or maintenance of one system, the overall topology goes to an N level of redundancy. 3M2: This topology aligns the load over more than two independent systems. The distributed redundant topology is commonly deployed in a “three-to-make-two” (3M2) configuration, which allows more of the capacity of the equipment to be used while maintaining sufficient redundancy for the load in the event of a failure (see Figure 2). The systems are aligned in an “A/B/C” configuration, where if one system fails (e.g., A), the other two (B and C) will accept and support the critical load. The load is evenly divided with each system supporting 33.4% of the load or up to 66.7% of the equipment rating. In the event of a component failure or maintenance in one system, the overall topology goes to an N level of redundancy. In theory, additional systems could be supplied, such as 4M3 or 5M4, but deployment can significantly complicate the load management and increases the probability of operator error. N+1 (SR): The shared-redundant (SR) topology concept defines critical-load blocks. Each block is supported 100% by its associated electrical system. In the event of maintenance or a failure, the unsupported equipment would be transferred to a backup system that can support one or two blocks depending on the design. This backup system is shared across multiple blocks, with the number of blocks supported being left to the design team but typically in the range of 4:1 up to 6:1. N+1 (CB): The common-bus (CB) redundant system is like the shared redundant system in that the IT equipment’s A and B sources are connected to an N+1 uninterruptible power supply (UPS) source, but in the event of a failure or maintenance activities, the load is transferred to a raw power source via STS. The raw power source has the capability of being backed up by generators that are required to be run during maintenance activities to maintain the critical load. The above topologies assume a low-voltage UPS installation. However, similar systems can be developed using a medium-voltage UPS. 2N topology. The premise behind a 2N system is that there are two occurrences of each piece of critical electrical equipment to allow the failure or maintenance of any one piece without impacting the overall operation of the data center IT equipment. Distributed redundant (3M2) topology. The premise behind a 3M2 system is that there are three independent paths for power to flow, each path designed to run at approximately 66.7% of its rated capacity and at 100% during a failure or maintenance event. N+1 common bus (N+1 CB). The premise behind the N+1 CB system is there is one primary path that supports each IT block. This path also has an N+1 capacity UPS to facilitate maintenance and function in the event of a UPS failure. The system is backed up by a simple transfer switch system with a backup generator. What generator rating should be used for a data center? Continuous power: designed for a constant load and unlimited operating hours; provides 100% of the nameplate rating for 100% of the operating hours. Prime power: designed for a variable load and unlimited running hours; provides 100% of nameplate rating for a short period but with a load factor of 70%; 10% overload is allowed for a maximum of 1 hour in 12 hours and no more than 25 hours/year. Limited running: designed for a constant load with a maximum run time of 500 hours annually; same nameplate rating as a prime-rated unit but allows for a load factor of up to 100%; there is no allowance for a 10% overload. Emergency standby power: designed for a variable load with a maximum run time of 200 hours/year; rated to run at 70% of the nameplate. What IT distribution voltage should be used? How much power needs to be delivered to each IT cabinet initially, and what does the power-growth curve look like for the future? What are the requirements of the IT equipment power supplies? Will legacy equipment be installed in the data center? Can the facilities team decide on the power supplies to be ordered when new IT equipment is purchased? Let’s start with the power of a 3-phase circuit. A 208 Y/120 V, 3-phase, 20-amp circuit can power up to a 5.7-kVA cabinet. Per NEC Article 210.20, branch-circuit breakers can be used up to 80% of their rating, assuming it’s not a 100%-rated device. Therefore, a 208 V, 3-phase, 20-amp circuit can power a cabinet up to 5.7 kVA (20 amps x 0.8 x √3 x 208 V). Now, if that same 20-amp circuit was operating at 415 Y/240 V, 3-phase, then that circuit could power a cabinet up to 11.5 kVA (20 amps x 0.8 x √3 x 415 V). That’s more than twice the power from the same circuit for no extra distribution cost. If the specifications for the IT equipment can be tightly controlled, the decision to standardize on 415 Y/240 V distribution is a pretty simple one. However, if the IT environment cannot be tightly controlled, the decision is more challenging. Currently, most IT power supplies have a wide range of operating voltage, from 110 V to 240 V. This allows the equipment to be powered from numerous voltage options while only having to change the plug configuration to the power supply. However, legacy equipment or specialized IT equipment may have very precise voltage requirements, thereby not allowing for operation at the higher 240 V level. To address this problem, both 208 Y/120 V and 415 Y/120 V can be deployed within a data center, but this is rarely done as it creates confusion for deployment of IT equipment. The follow-on question typically asked is if the entire data center can run at 415 V, rather than bringing in 480 V and having the energy loss associated with the transformation to 415 V. While technically feasible, the equipment costs are high because standard HVAC motors operate at 480 V.
Must we install an emergency power-off system? Emergency power-off (EPO) buttons are the fear of every data center operator. With the push of a button, the entire data center power and cooling can be shut down. Because of the devastation that activation of an EPO can cause, EPOs typically are designed with a two- or three-step activation process, such as lifting a cover and pressing the button or having two EPO buttons that must be activated simultaneously. These multistep options assume that the authority having jurisdiction has provided approval for such a design. However, EPOs are not necessarily required. Can we use photovoltaic systems to power our data center? Corporations and data center investors are demanding sustainability be built into the data center. The positive impact on public relations by showcasing a sustainable data center can’t be underestimated, especially considering how much of a power hog data centers can be. A PV system may or may not provide power during a utility power failure, depending on the type of inverter installed. The trend is to provide a PV system that offsets some of the noncritical-administration power usage. These systems are typically small (less than 500 kW) and can be located on building rooftops, carports, and on the ground. Design topology evaluation also should consider the medium-voltage uninterruptible power supply (UPS). Like the topologies using the low-voltage UPS, the medium-voltage UPS can be deployed in 2N, N+1, and 3N/2 configurations. Regardless of the topology used, medium-voltage UPS systems offer advantages over low-voltage UPS systems. They generally are installed outdoors in containers, thereby minimizing the conditioned building footprint. The need often arises to supply more current to a load than the output current rating of an available power supply. At such times it may be possible to connect two or more supplies in parallel in order to deliver the desired current to the load. Connecting the outputs of multiple power supplies in parallel will not guarantee the load current is shared between the units in an acceptable manner. Many factors contribute to the potential challenges in configuring paralleled power supplies to share load current. This paper presents basic characteristics of power supplies and discusses the methods of paralleling units in order to deliver a desired current that is not available with a single unit. By using an ATS or changeover switch allows you to switch between solar and grid. This is a comprehensive guide on how to make your own DIY changeover switch using contactors, Arduino & transistors. It’s suprisingly simple! Safety, maintainability, code compliance, and economics play crucial roles in determining the topology of an emergency system for a critical facility. Specific requirements for emergency power vary based on the mission critical facility. Hospitals and data centers have the one of the highest power availability requirements in the industry to ensure minimal to no interruption of service in critical areas. As building typologies, hospitals and data centers are inherently distinct, one being largely unoccupied and the other providing life-safety services to inpatients. The electrical systems of hospitals appear to be trending more toward the robust designs found in data centers. Data centers house computer equipment used to process, analyze, and store electronic data. Many businesses today rely on services performed within data centers to maintain their own functionality, including day-to-day IT/communication infrastructure. The need for electronic data is growing while the need to process or access this data at all times also is increasing. Keeping these buildings available 7×24 is a necessity, not a luxury. Demand for uninterruptable reliable power in data centers is now the norm. As most of these facilities are not regulated by the government, their electrical system topology is flexible and innovative. Guidelines, such as Uptime Institute and Telecommunications Industry Association (TIA), are used industrywide. Hospitals are increasingly requiring redundancy in their electrical systems, especially as the use of computers and electronic equipment to save lives and improve the patient experience has become integrated into critical care. As technology evolves, the number and complexities of hospital systems requiring uninterruptable power steadily increases. Data centers predominately use dual-corded equipment for critical loads, while hospitals rely on single-corded systems. Data centers use centralized uninterruptable power supply (UPS) systems for critical loads, while hospitals have preferred to use internal equipment UPS to allow equipment to be transferred from room to room. We are starting to see the uses of centralized UPS systems, especially for operating room lighting applications. Mini-data centers also are part of hospital medical record systems that employ centralized UPS systems. Data centers are often required to operate 7×24 without critical load scheduled outages. Critical load is all electrical loads required to perform the intended task. Most hospitals occasionally can be shut down for repairs or maintenance, but this trend is changing because electrical system uptime is increasingly considered an expected level of service in hospitals. Hospital start-up sequences for larger generator plants are usually faster due to critical and life-safety time requirements. Hospital breaker coordination is required by code, while the data center industry considers it good practice. Data centers frequently have had better and more up-to-date documentation on breaker coordination, but more hospitals are now keeping track of this information, too. Hospitals typically use automatic transfer switches to separate different branches; data centers tend to use electrically operated breakers in a “main-tie-tie-main” configuration. Electrical engineers must consider many factors when designing backup, standby, and emergency power systems. Specific requirements for emergency power vary based on the mission critical facility, such as a hospital or data center. Intel’s Rack Scale Design (RSD) supports comprehensive management for all resources in the data center, enabling a true software-defined infrastructure. RSD data-center architecture separates compute, storage, and network resources into groups of components, called pools, that can be efficiently assembled or “composed” on demand to create a precise hardware configuration to match a specific software workload requirement. Because resources are separated and abstracted, each type of resource can be expanded, replaced, or upgraded on its own refresh cycle. Power safety margins required to compensate for the inability to accurately predict power load demands, including peak and seasonal variations. Unpredictability, exacerbated by very-high-performance systems, which may drive increasingly large variations in power consumption during peak performance periods. Power equipment that’s typically only available (or economical) in large increments. Software-Defined Power (SDP), combined with associated hardware, manages provisioning by employing Intelligent Control of Energy (ICE). This involves monitoring power consumed by IT loads at sub-second intervals using strategically located power sensors. This includes ICE hardware that’s been optimized to provide sensor data. Acting as a unit, the ICE hardware makes it possible to exceed, for short periods, the rack or branch circuit breaker capacity, providing peak assurance beyond breaker limits without tripping any breaker. This group policy control is referred to as ICE Rackshare and acts as an application running on the controller. The ICE system includes the ICE Block and ICE Switch, a power monitoring and switching system that delivers dynamic redundancy capabilities. It allows unutilized power to be provisioned to additional servers, then reallocated to critical equipment if an outage occurs. ICE employs an optimization algorithm that dynamically controls the mix of utility power and local battery power consumed at different points in the data-center topology. An explanation of how Uninterruptible Power supplies operate with animated block diagrams. Explains the differences between Transient Voltage and Surge Suppressors (TVSS), Automatic Voltage Regulators (AVR), Standby UPS’s, Line-interactive UPS’s and Online (Dual Conversion) UPS’s. This video also provides a summary of the features of the most common types. The Markley Group demonstrates how power at a UPS in a data center is transferred without its critical loads seeing any interruption. Routinely this type of procedure is performed at One Summer Street to allow technicians to safely work on critical electrical equipment without any risk to your information. It’s an automatic changeover switch for a backup generator supply. When power fails and the generator starts, the switch will automatically transfer over to the generator. When the power returns it will switch back over to the main supply. This Old House host Kevin O’Connor shows how to keep the electricity flowing during power outages. For example, NFPA 110: Standard for Emergency and Standby Power Systems has specific requirements for things like start time for emergency power systems. Also, the U.S. Environmental Protection Agency can have more stringent pollution-control requirements for generators that operate while normal power is available. Note a general rule states that a generator should be sized 2.5 times larger than the largest motor it is required to start. Generator manufacturers have online software tools that can aid this effort. Is a generator bus required? Generator buses connect all the generators together (Figures 1 and 2). This bus is then connected to load buses via tie breakers. Separate generator buses have the advantage of allowing generator-paralleling testing without disturbing the facility’s load. Are redundant utility sources required? If redundant utility sources are required, the switchgear will increase in complexity. These sources need to connect to the load bus in addition to the generators. Standby generators generally operate in a relatively narrow band of roughly 70 to 75 gal/MWh in their most efficient range-usually 75% to 80% of nameplate capacity-and exhibit the familiar bathtub curve over their operating range. Larger units are typically a bit more efficient than smaller units. This narrow range of efficiencies is due to the fact that diesel engine technology is driven largely by the transportation industry, where fuel efficiency is a primary driver of purchasing decisions. Simple SPDT solid state transfer switch using TRIACs. Transfer switch using TRIACs intended to switch between the Utility power and an intermittent source such as solar or wind. The MAX16141 36V ORing FET controller with voltage and current circuit breaker offers a full suite of system protection functions. It provides a fast response time of 0.3 µs to reverse current events, which increases system hold-up time and functionality during automotive transient conditions. The device is used for monitoring over-voltage, under-voltage, over-current, reverse-current and over-temperature conditions in automotive power applications, including infotainment and advanced driver assistance systems (ADAS). I delved into a world of telecom power modules, which “must” work forever. To achieve forever, the power distribution is made redundant: though one unit can do the job, two PMs power the same rack in case the other fails and needs replacement, which would be performed by so-called “hot-plugging” while the rack is under power. Hot-plugging a PM into the 40-60V telecom bus is a tricky business. The current flow to the module is controlled by an onboard MOSFET; to deal with 1 kW, it must be fully on or off. Upon the module insertion, the transient from off to on must be fast but not too fast; otherwise, the inrush current that charges onboard capacitors may brownout the telecom bus. The same MOSFET doubles as a circuit breaker. If an inboard short is suspected, the reaction must be fast, but “nuisance” spikes, common in power environment, must be ignored. In the field for weeks, thanks to redundancy, one PM kept the rack operational, while the shorted PM, with access to unlimited power, reacted happily to 30A-inrush, keeping the MOSFET alive by kicking on-immediately-off every few seconds. The overprotective laboratory settings killed the MOSFET in 20ms. When picking a switch to use in electrical design, many people believe they can use any switch, provided its current rating is more than the maximum load in the circuit. This, of course, isn’t true. This is why it’s so important for designers and engineers to understand how to pick the right switch for their product. Imagine you have two circuits, each carrying the same current—one is an ac circuit and the other is a dc circuit. When you switch off power to an ac circuit, a voltage spark (or arc) is created inside the switch that’s quickly extinguished—a desirable condition. This is because an ac sine wave is naturally at zero amps twice per cycle. So, there’s a 50% chance that the power to the circuit will not be at peak levels when the power is switched off. However, this isn’t the case in a dc circuit, where both the current and voltage are constant. When power is switched off to a dc circuit, it can take much longer for the voltage arc inside the switch to extinguish itself. This is why the switching speed (how fast the switch contacts open and close) of a switch in a dc circuit is so important. The objective is for the switch contacts to separate as fast as possible when turning off power to the circuit. This helps minimize the arc’s time to develop and extinguish itself. The longer a switch takes to open or break the power to the circuit, the more prolonged the arc. This can result in the switch contacts becoming pitted, potentially lead to overheating, premature switch failure, or even a fire. As well as the speed at which the switch works, the nature of the electrical load is important in determining whether a switch will be suitable. Will it be switching an inductive or resistive load? This will affect both the voltages and currents your switch has to deal with. an inductive (L) load, such as a transformer or electric motor, will initially draw a large amount of “inrush current” when first switched on before settling back down after a few seconds to the load’s full running current. Also, when an inductive load is switched off, a huge voltage develops across the switches’ contacts in the form of an arc. This arc voltage can be much higher than what the switch is rated for, which can lead to contact pitting and shorten the switch’s life. For the same current rating, the dc voltage rating on a switch will generally be much lower than its ac voltage rating. For example, a switch rated for 15 A at 250 Vac will only be rated for 15 A at 12 Vdc. The only difference is whether you are dealing with ac or dc. it’s always best to choose one that’s been certified to a recognized standard. This will ensure it performs—both electrically and mechanically—the way it’s intended. Two important standards bodies in this regard are the Underwriters Laboratories (UL), and Verband der Elektrotechnik, Elektronik und Informationstechnik (VDE). Learn the differences between enterprise, co-location, and cloud data centers. Understand co-location electrical systems and factors that determine how they are configured. Traditionally, corporate/enterprise data centers and data center operations were kept in-house. The land, building, and all equipment were owned, maintained, and operated by the enterprise company. These in-house-type of data centers are what the industry now refers to as enterprise data centers. For some companies, the enterprise data center can be a small server room. For others, it can be a large multibuilding facility. 2N utility services: Fully redundant utility service with the capability to serve the critical load from either service. 2N UPS systems: Fully redundant UPS systems where the failure of one system will result in the critical load transferring to the other UPS system to remain protected. N+1 or N+2 generators: Due to the expense of a fully redundant generator plant, generators are typically provided as Need (N) plus one or two to allow for one generator to be out for maintenance and still survive a failure. Oftentimes, there is also a means to connect a portable generator to the system. 2N distribution: Fully redundant distribution pathways from the utility service to the server cabinet. Maintenance bypass: Distribution pathways that bypass major equipment like a UPS to allow for its maintenance without shutting down the downstream critical IT equipment (concurrent maintainability). N utility service: Utility-service redundancy can vary between providers and locations. Due to the expense, it is common to see a single utility service with capability to add a second in the future. In an area where a second utility source is readily available or inexpensive, the provider may add the 2N utility service for increased availability. N+1 or N+2 UPS systems: UPS systems usually are arranged in some type of isolated redundant configuration (“catcher system”) where one or two UPS systems back up multiple units or a distributed redundant system where they use three systems to make/serve two. N+1 or N+2 generators: Due to the expense of a fully redundant generator plant, generators are typically provided as Need (N) plus one or two to allow for one generator to be out for maintenance and still survive a failure. Oftentimes, there also is a means to connect a portable generator to the system. Redundant distribution: This characteristic/approach varies between providers. Some providers use a full 2N redundant distribution topology. Others use a combination of 2N and distributed redundant architectures, otherwise known as “3 to make 2.” Both of these system topologies can provide for concurrent maintainability of equipment, but they vary in their level of stranded (unusable reserve) capacity and the level of operational management required. One big difference between enterprise and co-location data centers is the shared infrastructure. With enterprise data centers, the main/primary electrical and redundant electrical systems serve only one end user’s equipment. In the co-location data center, the electrical infrastructure and redundant equipment is shared among multiple customers. If a tenant or data hall is using the redundant equipment during maintenance of its equipment, it may not be available for another tenant’s equipment in a failure scenario. Because of this shared infrastructure, some co-location providers add additional redundancy (N+2) to the facility for added reliability and availability. 1N or 2N utility services: Where available, fully redundant utility service with the capability to serve the critical load from either service is preferred. Cloud data centers can be very large in size, however, making it difficult to obtain full 2N redundant utility feeders. N or N+1 UPS systems: UPS systems can vary between cloud providers. Larger cloud service providers use battery backup built into the server and avoid a central redundant UPS system. Others that do not have that technology will use an N+1 isolated redundant-type UPS configuration. N+1 generators: Generators typically are provided as need plus one to allow for one generator to be out of service for maintenance. Oftentimes, there also is a means to connect a portable generator to the system. Single distribution with maintenance bypass: Distribution pathways that bypass major functions to allow for maintenance without shutting down the equipment (concurrent maintainability). Cloud data centers are similar too co-location in that they can determine the size of the data center and set the Need (N) based on their specific business model. Because the redundant equipment in cloud data centers is more for availability and maintenance, the need or base systems in the N+1 configuration is set much higher in cloud data centers (12 to 16) than for co-location (4 to 10) or enterprise data centers. Meaning there is one redundant unit for every 12 to 16 base units (one redundant generator backing up 12 or 16 base generators). Providing continuous, high-quality electrical power is among the most important obligations of the co-location data center owner. Electrical engineers must consider many factors when designing power/electrical systems for these co-location facilities. Issues such as backup, standby, and emergency power systems must be incorporated. Co-location facilities differ slightly in that they may have metered/submetered power systems or power based on occupancy measurements. Co-location data centers are facilities where data center rack space is rented out to companies that require secure and reliable data center space. They provide secure computing space for companies so that they can spend time on their core business rather than operating data centers. Co-location building owners’ business model requires that they push the envelope of design to remove unnecessary components, increase efficiency, and prioritize design decisions to meet the terms of their contracts. The design engineer for co-location owners must understand these drivers and design a system that supports the co-location business model. An open source automatic transfer switch based on the Infineon CoolMOS™ C7 MOSFET. I have created the world’s first open source automatic transfer switch (ATS), a device used by companies looking for the ultimate uptime for their data centers, like Facebook Google, and Amazon. I set out to create the world’s first open source (MIT Licensed) automatic transfer switch using Infineon’s new 600V CoolMOS™ C7 Gold superjunction MOSFETs. The low RDS on means that I don’t need to parallel FETs to get the required current handling capacity (15+A), and there high breakdown voltage allows me to comfortably use them for switching the high peak voltages encountered in 120V/240V mains. There are 3 switching cells per AC input, one for the Hot, one for the Neutral, and one for the Earth. The Hot sides of the AC cannot just be tied together becouse they may be out of phase and may have different amplitudes, normally ±10% from nominal. The Neutral and Earth connections cannot be tied together because they potentially can vary depending on the load on the circuit. I chose a Microchip PIC32MZ for this project, it monitors the inputs and if the AC detect signal is interrupted for more than 10ms it will switch what AC input it is using to the other one. The microcontroller has 3 LEDs for indicating the status to the end user and a UART port for communicating with external equipment.